By 6:00 both Carl and Ruth were also gone. "Next Thursday is Thanksgiving, traditionally a holiday that ranks as a day for good eating, good fellowship and general celebration. 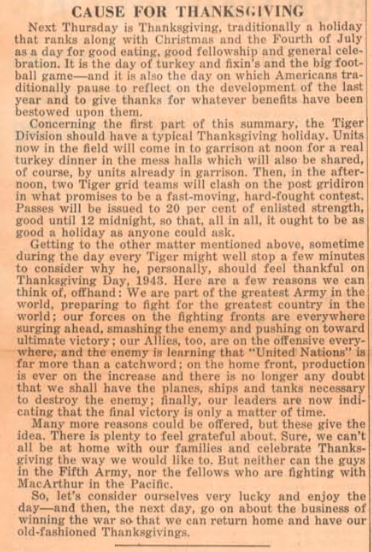 The Tiger Division should have a typical Thanksgiving holiday. Turkey dinner in the mess halls. Two Tiger grid teams will clash on the post gridiron in what promises to be a fast-moving, hard-fought contest. Sometime during the day every Tier might well stop for a few minutes to consider why he, personally, should feel thankful on Thanksgiving Day 1943. Here are a few reasons we can think of: We are part of the greatest Army in the world, preparing to fight for the greatest country in the world; our forces on the fighting fronts are everywhere surging ahead; on the home front, production is ever on the increase and there is no longer any doubt that we shall have the planes, ships, and tanks necessary to destroy the enemy;… there is plenty to be grateful about… So lets consider ourselves very lucky, and enjoy the day— and then, the next day, go on about the business of winning the war so we can return home and have our old-fashioned Thanksgivings."